Who doesn’t love a good facial? 60 minutes of someone dedicated to making your face look fabulous. I mean are we really going to spend 60 minutes at home pampering our face? Hardly. 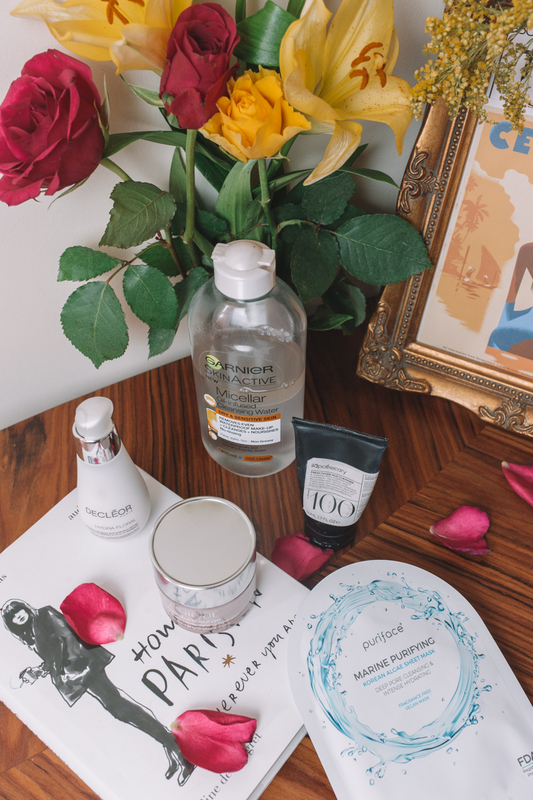 But when a facial can cost £60+ it’s not a treat not an everyday occurrence, and so we will need to spend some precious moments in our home bathroom instead. If I’m feeling like my skin needs some extra love and attention or I have some time on my hands say at the weekend, I have 5 hero products that I use for a complete facial experience. Each one I have been using for months if not years for some and have come to really love each one. So let’s go through them. Garnier Micellar Water is an all round amazing product. I could not be without this in my bathroom cabinet. I just find it so incredibly multipurpose. Cleansing my skin, cleaning up makeup mistakes, to even help clean my makeup brushes. But for an at home facial, I have to start with this. This preps the base and makes sure there’s not makeup and other surface grime on the skin left. I use the oil version as I find it so effective for getting makeup off. There literally is nothing it can’t remove, but if you have oily skin they do sensitive and normal versions too. Once my skin is clear, I go in and cleanse. 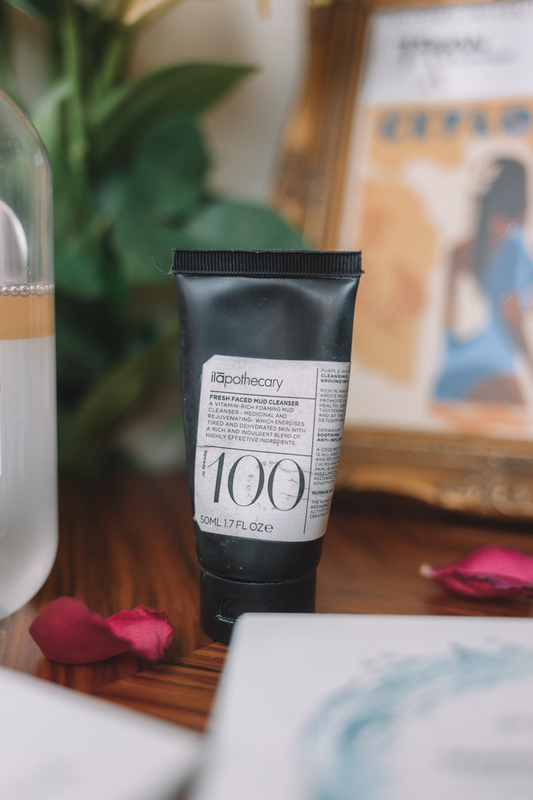 Ilapothecary is a brand I recently discovered and now their Mud Cleanser is a staple in my cabinet too. 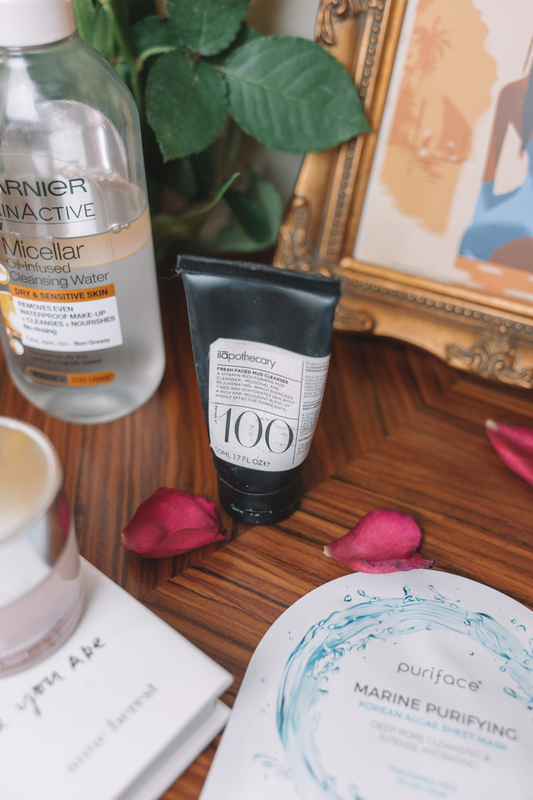 A vitamin rich cleanser it’s super powerful however why I love it as a at home facial product is that you can leave a fairly thick layer on as a mud mask and it sets just enough so you can lie and let it really work in. Depending on how much time I have, I leave it on for anything from 5-15 minutes before washing off. Trust me, you’ll feel squeaky clean after that. Ah Korean beauty. It’s all the rage isn’t it? And one of the big things they’ve brought over are sheet masks. Personally I love them, as all you have to do is peel on and relax. 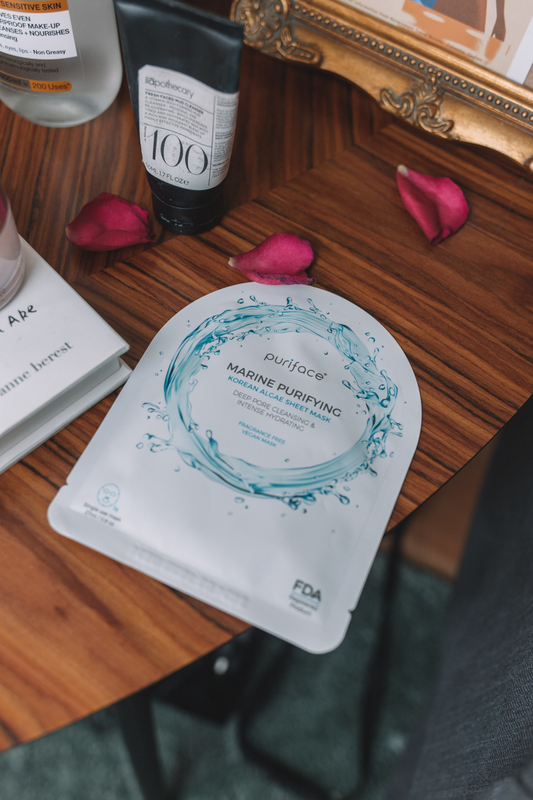 Puriface Marine Purifying Korean Algae Sheet mask helps cleanse pores and hydrate which is key for me as I’m very susceptible to large visible pores. I’ve been using sheet masks as part of a weekly treat for a while now and really love how they make my skin feel and look. Leave on for 15-20 as the next step in your at hone facial, and I promise you your skin will glow. 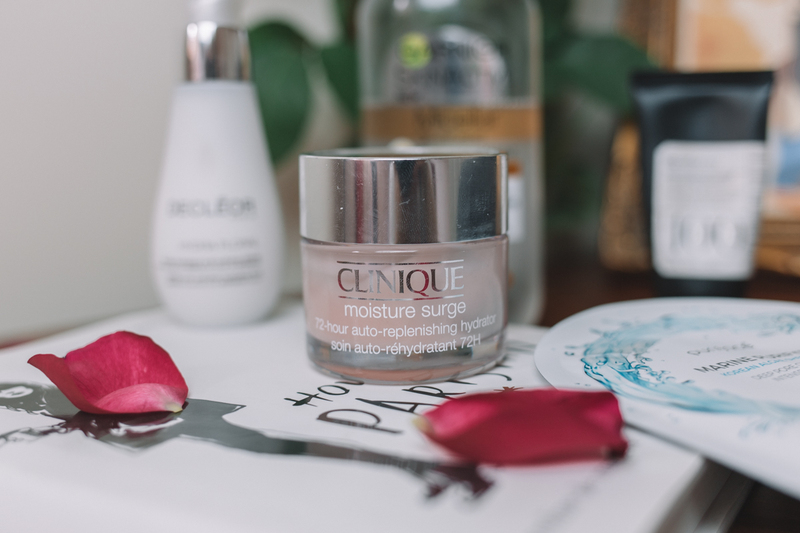 Next it’s time to moisture surge your skin with Clinique Moisture Surge. This is my absolute favorite moisturizer and I actually use it everyday, however for that facial experience, put on a thickish layer like a mask and leave on for 5 minutes to really drench your skin. Even after you wash it off, your skin will feel so soft and hydrated. Finally, layer on that serum. 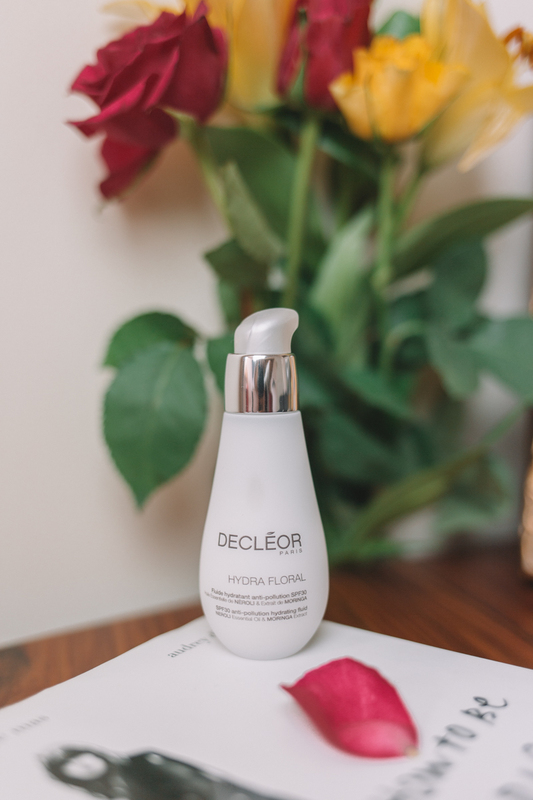 For a special treat, I use Decleor Hydra Floral, anti pollution hydrating fluid. As you can see I’m big on hydration for my skin. It’s key to keeping it plump and youthful as long as possible. I apply a thin layer to my skin and give myself a little facial massage to work it into the skin. After all of that my skin looks amazing and I’m either ready to face the world, or in need of a good nap, depending on how you look at facials. These products can be used time and time again, saving you a considerable amount compared to a spa facial, and are great for those moments when you need a little TLC but don’t have the means to get to a spa. 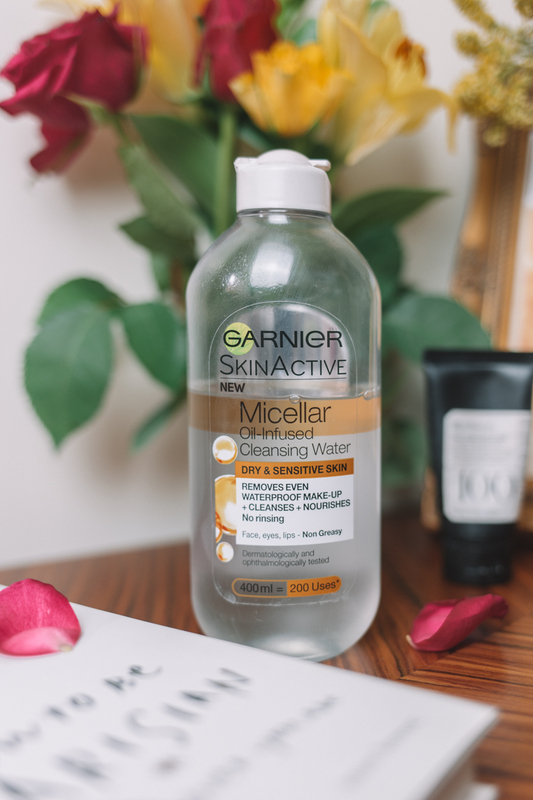 I absolutely love the Garnier Micellar water!